Sonoma County Distilling Black Truffle Rye (50.0%): As you all know Sonoma County and Santa Rosa residents are fighting for almost two weeks against devastating wildfires. Agricultural lands are wiped out, homes are destroyed and residents are displaced... Damage is big and it will take a long time for the region to recover. 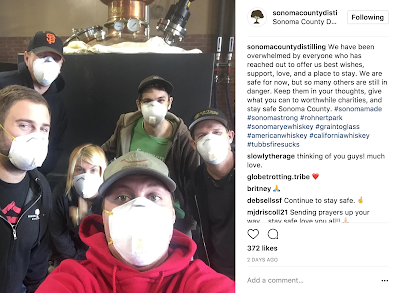 Sonoma County Distillery and its crew is safe... Replying a message I sent to him a few days earlier the owner and head distiller Adam Spiegel said that they are pushing hard and staying safe. Our thoughts are with them and we wish the best for everybody in the area affected by this tragedy... So, tonight I will pour some Black Truffle Rye and raise my glass to all the firefighters and first responders for their brave and tireless efforts to keep everybody safe. Black Truffle Rye is based on a straight rye whiskey distilled in Sonoma County Distilling's direct fired alembic style pot stills from a mash-bill of un-malted rye as its primary grain sourced from Canada and some malted rye sourced from the UK and aged not less than two years in American oak casks. After that the whiskey is infused for over four months with black truffles imported from France. Only 81 cases are produced for this particular batch and the bottle I have is bottled on March 31st, 2017. Color: Dark amber, unpolished copper. Nose: Not as funky as I thought that it is going to be... Noses like a straight young craft rye whiskey: Allspice, sweet pipe tobacco and toasted young wood. Ground clove, cinnamon and nutmeg. Unlit cigars, sage and and black gardening soil. Finally some mold, damp rags and cumin after a while... Adding a few drops of water refreshens it: Granny Smith apples, fresh thyme and pine cones. Palate: Still not overpowering but truffles are more detectable this time. White wine vinegar, apple cider and soft aged cheese. Cinnamon, unripe persimmons and brown sugar. Green wood and cherry rhubarb pie. Some aged pomace brandy and savory mushroom turnovers. It gets quite doughy and thick in texture in time. Adding water works quite well... It thins the texture, makes the mouthfeel lighter but keeps most of the earthy and musty qualities. Finish: Long with white pepper, wine vinegar and nutmeg. Overall: Ok, I have to admit that I was a little skeptical about the whole truffle idea in the beginning but I am surprised how good it is... The core remains as a straight rye whiskey from nose to finish with very subtle and enjoyable musty notes here and there. I liked it... I only can imagine how much it would cost to let a batch of whiskey sit in truffles for almost five months and therefore I totally understand why the price tag is that steep but it is an expensive whiskey for sure... I am not saying that it is not worth it, it is just expensive. Recommended for any adventurous whiskey drinker and cocktail maker.